Puppy vomiting is sure to elicit fear in the eyes of a new puppy owner. Many questions will run through the mind of the owner. What is wrong? What can I do to make it stop? Should I call a veterinarian? These questions continue to go on and on as the person analyzes the problem and possible solutions. Puppy vomiting is particularly a problem if it occurs over the weekend when most veterinarians are off. Therefore, this article is geared towards relieving your fears and enlightening you on the causes of a vomiting puppy, as well as when it is time to seek medical assistance. There are multiple different reasons that a puppy could be vomiting. One of the most common reasons is consuming something that disagreed with his or her stomach. Just like humans, puppies can become sick as a result of items they eat. Also similar to people, they may get sick for eating too quickly or running around and getting too hot soon after eating. Each of these situations are examples of minor problems that do not require assistance of a veterinarian as long as they are not frequent occurrences. However, a vomiting puppy may be a sign of more serious problems as well. One of the key ways to determine if your puppy is truly sick and needs medical assistance is if their appetite depletes. In this case, your lovely puppy may avoid eating. Furthermore, lethargy is another common symptom that accompanies the vomiting and refusal to eat. The lethargy can be denoted by a complete lack of normal activity level. Diarrhea may also be present if the condition is more than your typical puppy vomiting. If your puppy exhibits these symptoms in combination with vomiting it is time to call your veterinarian. Now let’s examine some of the more serious reasons that your puppy may be vomiting. Diseases and illness are often more serious concerns. Your puppy may have problems with his or her liver or esophagus. Furthermore, it could be a result of pancreatic issues, ulcers in the stomach, or even cancer. The following conditions could be a cause of the vomiting if your puppy is not up to date on shots: giardia, parvo, leptospirosis, etc. Severe parasite infestation as well as carsickness are other situations in which vomiting may occur. Obviously motion sickness is not a very severe problem, especially in comparison to the other discussed in this section. As with humans, treatment will vary depending on the exact cause. Again, if your puppy is vomiting and also has diarrhea, lethargic behavior, or refusal to eat then you should see a veterinarian as soon as possible. These could be an indication of extremely serious conditions. Furthermore, if you notice blood in the vomit or in your puppy’s stool, make sure to visit a vet. Finally, if your puppy may have encountered toxic materials then consider it a medical emergency and find a way to have your dog see a vet immediately for an examination that may be life saving. In conclusion, puppy vomiting is typically not a very serious condition as long as it is not accompanied with other symptoms described above. Chances are the vomiting is acute and could be due to a variety of things, including eating too quickly, being too active after eating, or even motion sickness. 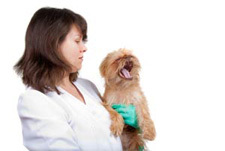 These situations do not require seeing a veterinarian unless the vomiting continues to be a prolonged issue. Therefore, do not panic at the first sight of puppy vomit. Instead, relax and monitor your puppy for other symptoms that may be indicators of a serious problem. If these other symptoms do not occur, the vomiting will probably subside soon.